It’s no big secret that I love to bake. So when two of my friends took a trip to Atlanta recently, they were kind enough to bring me a new baking book – Sonya Jones’ Sweet Auburn Desserts. This collection of recipes, named for the author’s bakery in Atlanta, focuses on Southern and African-American traditional recipes. My attention was immediately caught by one of the recipes – the Sazerac Tassies. Sazeracs are a New Orleans variation on an Old-Fashioned, one of the earliest examples of an American cocktail. Made with rye, absinthe, and Peychaud’s bitters, the cocktail has a distinct licorice note. The word tassie refers to a traditional Southern tart, so teeny that they are served more as cookies. Chef Jones plays up the licorice flavor of the Sazerac in these treats, filling the tartlet with a light custard flavored with anise liqueur. I was intrigued because the Sazerac is a favorite cocktail of mine, as a lover of all things licorice, and I liked the idea of the cute little tarts. So when the third Comicazi Cookie Clash rolled around, I decided to bake the little guys as my wild card entry. I was pretty sure that they wouldn’t do well in the judging – anise is a very polarizing flavor – I know far more folks who don’t like the black jelly beans than those who do (whereas I have loved them from an early age!) I decided to make them anyway because it was something new and it’s important, when one is baking six dozen cookies for charity, to make cookies that you want to eat. 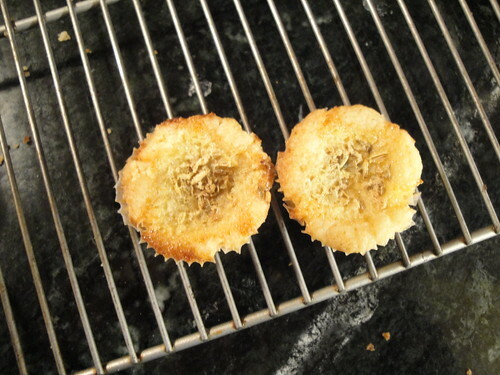 despite a mini muffin tin with a non-stick surface AND some strategic use of cooking spray, my tassies stuck. Hard. Any attempt to remove them, from a sharp knife around the edges to some gentle tapping on the bottom led to the tops dislodging. In the end I had to scrape the entire first batch out of the pan and into a giant, sticky mess that I regrettably neglected to photograph. However, did I let disaster stop me? Heck no I did not! For the second half of the dough I added a key ingredient – mini cupcake liners. I’d considered them at the beginning but since they weren’t called for had decided to leave them out. I fretted that I would still have a sticky mess, this time with paper embedded in it, but thankfully this was not the case – round two came out beautifully! The tart dough was buttery and light, the custard sweet and full of licorice flavor. From my point of view they are the perfect treat! As I suspected, the judges disagreed and these cookies did not do well in the Clash (although my Mexican Chocolate Brownies placed in the bar category, thank you very much.) However, my fellow licorice-lovers adored them, so I feel quite justified in my choice. If you hate licorice but like the idea of mini, flaky tarts, I think the flavoring could easily be changed to lemon or almond or anything you might prefer – the recipe can be found at Serious Eats. I’ll definitely make these again and would love to hear about any modifications you make!